Welcome to this brilliant collection of Colour Hanjie! 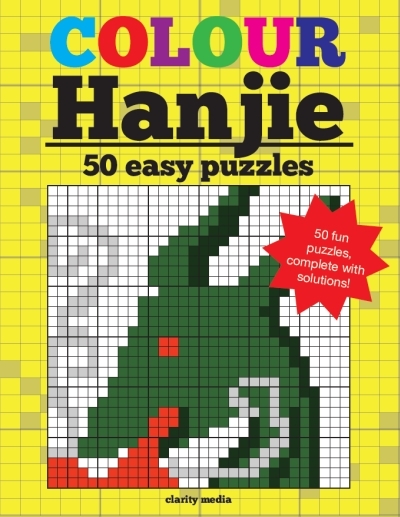 This book is the perfect way to introduce yourself to the fun and interesting puzzle that is, colour hanjie! A Hanjie Puzzle Consists of a grid that may be of any width or height. The aim is to fill in the number of squares specified in each row and column to create a picture. Typically, the larger the grid the harder the puzzle though this does not always follow. You will notice at the top and left of the puzzle are a set of numbers and colours. These indicate which cells within the grid are to be filled in using the specified colour. Cryptic clues are also featured alongside each puzzle to give you a themed hint. The puzzles get more difficult as you work through the book in order to slowly introduce you to the complex solving skills that are sometimes required with this puzzle type. Up to the challenge? Put your best puzzle solving skills to use and see if you can solve them all! If you get stuck along the way, full solutions are featured towards the back of the book to give you a helping hand. Printed in a large 8.5 x 11 inch book and featuring very high quality paper for colouring in, this book is the perfect way to introduce yourself to this fantastic puzzle.